One lesson the financial crisis taught banks, corporations, and institutional investors is to match the term of their assets and liabilities. Reliance on short-term financing, whether it be repo or commercial paper, to fund longer term, potentially illiquid assets is deadly. 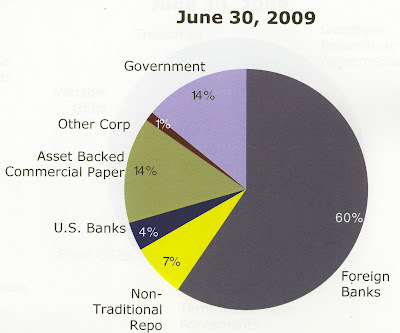 Lehman and Bear were unable to roll their repo financing, while Citi, RBS, and numerous others couldn't roll asset backed commercial paper on their CP conduits. Even GE had to get the Fed to purchase their commercial paper. Surviving institutions said "never again". Those who can issue longer term financing, even if it is more expensive have been doing so. Corporate treasurers do not want to wake up to find that they can not roll their short-term financing and will be forced to sell assets. The top rated issuers have been reducing their issuance of commercial paper as they roll into longer term liabilities. The graph below shows Tier-1 commercial paper issuance continues to decline. On the other hand buyers of short-term instruments are also under pressure. The typical buyers, money market funds, now have to increase liquidity, improve credit quality, and diversify even more. After the Reserve Fund fiasco, the SEC is on a war path to shorten average maturity of prime money markets' assets. At the same time top money market funds only buy Tier-1 credit assets, which becoming more scarce as the higher rated firms like GE push their liabilities further out (beyond the new duration restrictions of money market funds). The resulting rift between issuers and investors is becoming even more exacerbated as cash positions of retail and institutional investors swell. In addition, the latest SEC proposal for money market regulation forces funds to include treasury notes in their average duration calculation, effectively restricting the proportion of treasury notes (anything longer than bills) in the portfolio. The business of running prime funds will only become more challenging going forward, limiting investor choices only to the larger mutual fund managers and banks like JPMorgan. These firms will effectively use money funds as a loss leader (or just low profitability business) to push investors into their more profitable mutual funds or banking products.